Millions of people in the United States struggle with the embarrassing and uncomfortable issue of toenail fungus. Dr. Michael Uro’s Foot Care Clinic in Sacramento offers the latest technology for toenail fungus laser treatment. 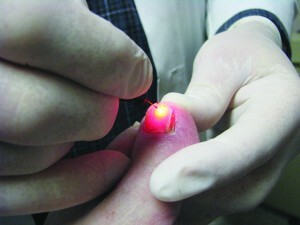 The toenail fungus laser treatment has multiple benefits, proving to be fast, safe and effective. Since beginning to use the toenail fungus laser treatment three years ago, Dr. Uro has seen new nail growth in patients as quickly as 4 months after the treatments. Within a year, the fungus infected toenails have replaced themselves with healthy new growth. Dr. Michael Uro Foot Care, Sacramento uses the Cutera GenesisPlus™ Laser system, which treats the toenail fungus by getting to the source of the problem immediately. The toenail fungus laser treatment uses tiny pulses of light from the GenesisPlus™ laser, which pass through the toenail to the fungus underneath. The fungus is eliminated without any damage to the surrounding toenail or skin. The procedure usually consists of one to three treatments, which last about 10 to 20 minutes each. Patients are able to walk out the door wearing the shoes they arrived in. The toenail fungus laser treatment has been cleared by the FDA, no pain medication is needed, and there are no known side effects.